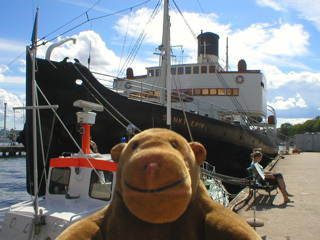 "That's quite a sharp front, you know"
Mr Monkey left the Finngrundet and scampered across the quay to have a look at the icebreaker Sankt Eric. This was Sweden's first sea icebreaker, only when it was built in 1915 it was called the Isbrytaren II. The name was changed as part of a major conversion in 1958, which included changing the engines. 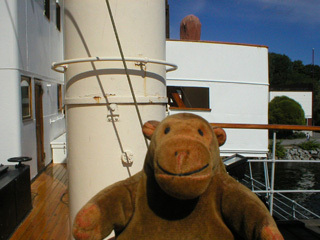 Mr Monkey admired the prow, designed to ride up onto the ice to crush it, then swarmed up some steps onto the upper deck.